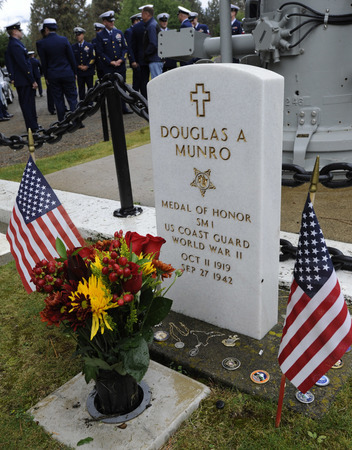 Those words may not be recognizable to anyone, but to each and every Coast Guard member, they represent a true hero: Signalman 1st Class Douglas Munro, the service’s only Medal of Honor recipient. 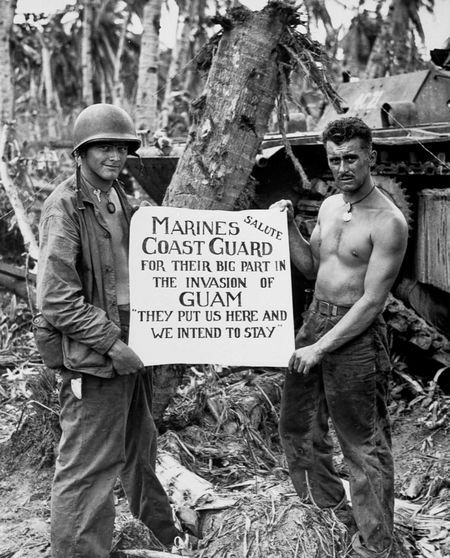 More than 75 years ago, those were the last words to he said before his death at the Battle of Guadalcanal. Ask any Coast Guardsman or Marine about Douglas Munro and you will instantly be taken back to Sept. 27, 1942, when he gave his life so a detachment of Marines might live. To a woman or man, each will recite Munro’s question to his best friend, Ray Evans. In many ways, Munro’s sacrifice is at the very core of the close relationship between the two services. All who hear Munro’s story instantly understand the bond between American brothers and sisters in arms and the true meaning of service to nation. Munro and others were responsible for navigating landing craft full of Marines along the coast. A month into the Guadalcanal campaign, then-Marine Lt. Col. Lewis B. “Chesty” Puller embarked three companies of U.S. Marines into landing craft to take control of the western region of Guadalcanal, one of the Solomon Islands in the South Pacific. Munro, 22, took control of 10 landing craft to move Puller’s men to the western coast. After successfully landing and moving 500 yards inland, Munro took all but one of the landing craft and returned to the staging area. Just an hour after landing on the western coast of the island, Marines forces were overcome by Japanese bombing raids, driving out their gunfire support. The Marines were being driven back to the beach and many did not have radios to request assistance. A single “HELP” spelled out in T-shirts on the ridge near the beach provided a sign of what the Marines needed. This is the official Coast Guard painting of Munro’s last moments while evacuating Marines at Guadalcanal. 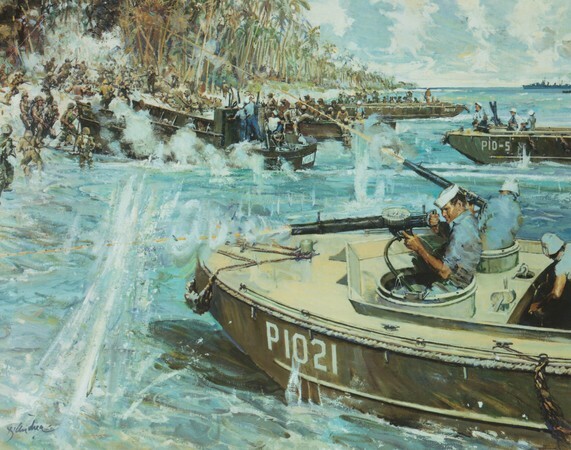 The painting’s original title was “Douglas A. Munro Covers the Withdrawal of the 7th Marines at Guadalcanal” and was painted by artist Bernard D’Andrea for the Coast Guard Bicentennial Celebration. 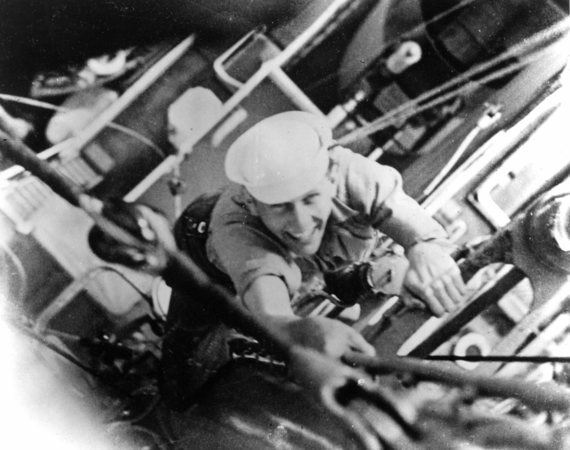 Signalman First Class Douglas A. Munro, shown above in a snapshot taken by a shipmate, gave his life while engaged in evacuating a Marine battalion. Signalman 1st Class Douglas Munro’s grave marker is surrounded by challenge coins, saint pendants, rate and rank insignia, and other items that have been left by military members and veterans in Cle Elum, Wash.
Munro, back at the staging area, volunteered to navigate the same landing craft to rescue the Marines from enemy fire. Nearing the beach and braving incoming fire, Munro directed the landing craft to push forward, even with Japanese forces gaining ground and nearing the beach. As the Marines re-embarked on the landing craft, Munro immediately navigated his vessel between the enemy fire and the Marine forces, providing much-needed cover for the Marines. With his efforts, all of the Marines, including the wounded, were safely taken off the island. Munro later help free a grounded landing craft that was full of Marines who were not far from enemy forces. At this same time, the Japanese forces began firing machine gun rounds and Munro was struck with a single bullet. He died before the forces returned to the staging area. In a letter dated just five days later, the commanding officer of the unit wrote to inform Munro’s parents of their son’s heroism and death. “Upon regaining consciousness his only question was ‘Did they get off?’, and so died with a smile on his face and the full knowledge that he had successfully accomplished a dangerous mission,” the letter said. More than 75 years later, Munro’s legacy lives on. He is remembered and honored by every member of the Coast Guard for his selfless devotion to duty and heroism. As Munro has become an inspiration for so many who have served in the Coast Guard for his sacrifice, Puller, one of the men he saved, would go on to become one of the most decorated members of the Marine Corps and inspire generations of service himself. For his sacrifice, Douglas Munro posthumously received the Medal of Honor, our nation’s highest military award – an award Puller himself nominated Munro for. The Coast Guard has honored Munro’s legacy throughout the past 75-plus years, including naming a 378-foot high-endurance cutter and the brand-new Coast Guard headquarters building for Munro. These enduring symbols are a constant reminder of what it means to live by the service’s core values.